Sage 'Ember's Wish' (Salvia X 'Ember’s Wish'): growing, planting, caring. 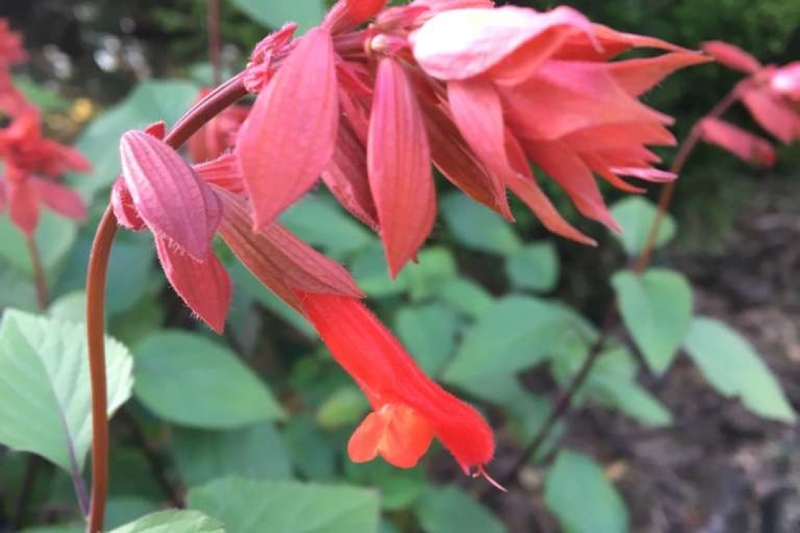 A beautiful hybrid of sage with bright tubular blossoms, of a light coral color, contrasting with the deep brown stems and mid-green foliage. This hybrid of sage has been obtained in Australia from another hybrid, Salvia x 'Wendy's Wish'. Growing about 80 cm high with a flared habit, Ember's Wish is a floriferous plant that requires little to no deadheading of blossoms. In areas with moderate temperatures - with mild winters, over -1 ° C - Ember's Wish grows well in full sun, but it will appreciate a bit of shade in hotter climates. In open soil: Sages are planted in spring or autumn, in a light soil, draining, humus, fresh, and rich. Place them preferably in the sun or in semi-shade. If your soil is not rich enough, add some ripe compost. Plant every 80 cm. Cover with soil and tamp to remove air around the roots, then water. Potted: Planting in pot is essential if the winters are rough. Choose a large container - 15 liters or more. Lay a layer of gravel, then place potting soil or very ripe compost on top of it. Arrange your sage at the proper height, then finish filling the pot. Tamp well and water several times. Cut in winter, shortening branches that compromise symmetry.